This promotion is only valid in MARCH 2010. Make sure you place your order soon, or else you'll regret later! *not inclusive of delivery charges. For delivery zones and charges, kindly click here. Nampaknya Kek Chocolate Moist iXalicious memang menjadi kegilaan ramai! Sampai tak menang tangan kami membuatnya. Dengan harga istimewa hanya RM30 per kilogram, anda boleh menggembirakan seisi keluarga dengan kek dari iXalicious. iXalicious is now featuring its first edible image for the beloved customers. With an additional price of RM0.50 only per photo, you can give your cupcakes/cakes more colours and attraction especially for the kids! Yang ini pula ditempah oleh seorang regular customer kami yang sekurang-kurangnya dua kali sebulan dia akan membeli Chocolate Moist Cake dari iXalicious. Mak dia sentiasa mengidam kek iXalicious katanya. So every now and then we purposely come out with a different decoration for his family. Lama betul kan tak update? Been quite busy to upload the photos and today we have the opportunity to! So here goes! It's pretty hard at the beginning to convince people that lemon flavour can make very scrumptious cupcakes! But guess what, hardwork pays! Many are more inclined to taste our signature lemon cupcakes. It's a good choice for dessert especially when you have a very heavy meal as the lemonish taste compliments its original sweetness. Why wait? Give it a try now! Thank you Tree Connection for the placement of order. They were interviewed by AM MAX, TV3 a couple of weeks ago and they'll be featured in the programme on March 14th, 2010. So why not everyone wakes up a little earlier than any usual Sundays to catch them up on AM MAX on TV3 at 8.00 am this Sunday the 14th! Stay tuned! Sebenarnya ini order daripada Malek Husaini yang sedang menuntut di Maktab Perguruan Temenggung Ibrahim, Johor Bahru. Nasib baik kebetulan ada kawan yang datang ke KL beberapa minggu lepas, jadi dapat kirimkan kepada bakal cikgu kita yang seorang ini. Dia order sekali dengan Kek Chocolate Moist yang sebelum ni. Tak sudah-sudah dipujinya blueberry cheesecake kami. Jadi, apa tunggu lagi? Place your order now. 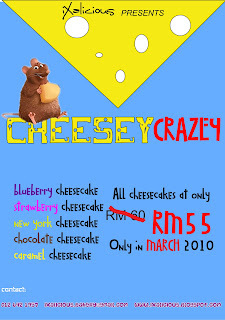 Only RM55 in March 2010!